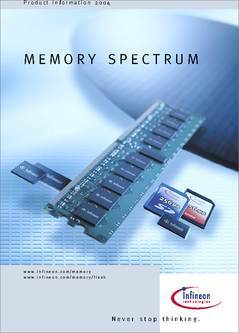 This edition of Memory Spectrum has been developed to enable you to easily view the entire range of Infineon's memory products. For more related product information and the latest datasheets, please visit our websites: www.infineon.com/memory and www.infineon.com/memory/flash. Double Data Rate (DDR / DDR2) and Single Data Rate (SDR). Synchronous Dynamic Random Access Memory. Double Data Rate (DDR / DDR2), Dual Inline Memory Modules (DIMMs). Single Data Rate (SDR), Dual Inline Memory Modules (DIMMs). RLDRAMTM and CellularRAMTM are registered trademarks of Infineon Technologies AG. TwinFlashTM is a trademark of Infineon Technologies AG, based on Saifun NROM technology.